How do you know if your advertising is just a bit over the top? 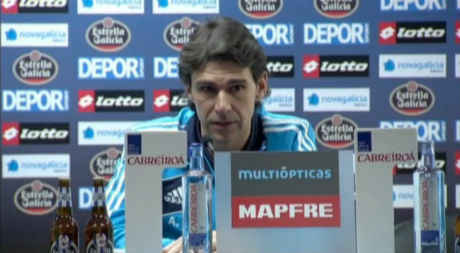 This is an interview/press conference surrounding a soccer match in Europe. When I saw this moment in a video I was watching, I had to pull a screen capture because it's such a wonderful example of a bad strategy that we can all fall into. The strategy where we try to say too many things at once and end up saying nothing at all. The person (who happens to be the reason the camera is on in the first place) is surrounded in advertising in the form of graphics and product placements. The very reason that anyone was in that room was to hear this guy speak...and they buried him in logos and bottles. It's ridiculous. And it's easy to do. But easy isn't always best. Even if it comes naturally.